The Maritime Chart Service allows you to configure as many map services that your system resources can support on a single instance of ArcGIS Server. By default, when you install Maritime Chart Service, it will add the capability to all existing map services, but you must enable the capability before it can be used. See Adding the Maritime Chart Service capability to a map service. The installation will also create a default location for all configuration files that the map service will use. Each map service that runs Maritime Chart Service can be configured independently, or some of the support control files can be shared. To support more than one map service with Maritime Chart Service enabled, you will need to repeat the steps in topic Setting Maritime Chart Service properties, and you will also need to copy the existing maritimechartservice folder containing your controlfiles, sencs, logs, and datasets support folders to a new location. Repeat the steps in Setting Maritime Chart Service properties if you haven't already done so. Locate your maritimeschartservice folder that was created and appended to the following path by the installer <Installation path>\arcgisserver\directories\maritimeserver\maritimechartservice. Copy and paste the maritimechartservice folder to a new location. Rename the new folder and update your property paths. See Modifying Maritime Chart Service capabilities properties. If sharing S-57 datasets, make sure to set your datasetsDirectory to that shared location. See the next section for more information, Sharing control files and S-57 datasets. Delete the existing .senc files in the new senc folder. Delete existing log files in the new logs folder. Make any additional modifications to your controlfiles folder and datasets. As described in the section Modifying Maritime Chart Service capabilities properties, there are three directory property paths that can be set. The workingDirectory property should never be shared and should always be on the physical server running your map service. The other two directory paths, controlFilesDirectory and datasetsDirectory properties, can be shared between map services depending on your operational needs. The datasetsDirectory and controlFilesDirectory properties can either be located on the physical server or on a file share. The benefit of sharing your datasetsDirectory property between multiple map services is the use of a single set of S-57 datasets which reduces the amount of maintenance when applying updates. This ensures that all shared services are using the same updated S-57 datasets. The benefit of using a single datasetsDirectory location per map service is that each map service is self-contained and can be updated independently of each other. For example, you want to provide services with ENC, IENC, and AML but not expose those services to all users; then they would need to be managed individually. The benefit of sharing your controlFilesDirectory property between multiple map services is the ability to ensure that all shared map services are uniform, meaning that the same S-52 view groups, symbology, and settings are identical and easy to configure, if necessary. The benefit of using a single controlFilesDirectory location per map service is that each map service can be individually configured. 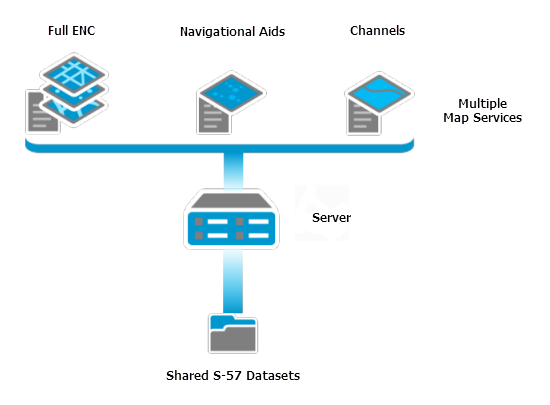 In the following image, you will see three separate map services, all sharing the same S-57 datasets, but each map services has a unique set of configuration settings based on what the service will use. For example, to only provide a Navigational Aids or Channels service, you can configure your S52DisplayProperties.xml for each map service to only show those features (layers) in your view. If you have completed all the configuration steps necessary, you can download a sample web viewer from GitHub that shows how to use the Maritime Chart Service functionality.